The H.E.S.S. telescopes have surveyed the Milky Way in gamma-ray light for the last 15 years. To celebrate this anniversary, the H.E.S.S. collaboration has published its largest set of science results to date in a series of papers in a special issue of the journal Astronomy & Astrophysics. The more than a dozen publications include the H.E.S.S. Galactic Plane Survey, studies of the populations of pulsar wind nebulae and supernova remnants, as well as the search for new object classes unseen before in very-high-energy gamma rays such as microquasars or shocks around fast-moving stars. These studies are complemented by precision measurements of shell-type supernova remnants such as for example RX J1713-3946 and diffuse emission at the centre of our Galaxy. This legacy data set will serve as a benchmark for the community for the coming years and until the next-generation Cherenkov Telescope Array comes online in the 2020s. In spring 2003, when the H.E.S.S. array of Cherenkov telescopes was still being commissioned, its first two telescopes were pointed at the centre of our Galaxy and the remnant of an exploded massive star. Both of these targets revealed gamma-ray emission thereby marking the opening of a new window for the study of Galactic sources of very-high-energy (VHE) gamma rays. In the following 15 years, the H.E.S.S. telescopes have continuously surveyed the Galaxy and targeted specific sources, making discoveries of ever new sources and object classes, pushing the field of ground-based gamma-ray astronomy ever further. This programme has now culminated in this publication of a series of papers in a special issue entitled 'H.E.S.S. phase-I observations of the plane of the Milky Way' (Astronomy & Astrophysics Vol 612, April 2018). Two of these 14 papers are about the first two objects observed and studied in 2003, the Galactic Centre and the exploded star RX J1713.7-3946, rounding up an exciting time of discovery and precision measurements of the Milky Way in gamma rays. 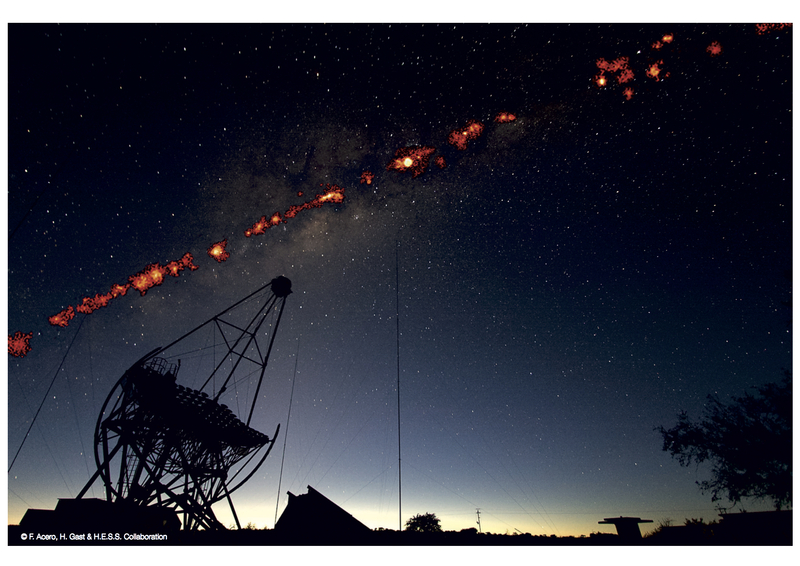 "This special issue is a milestone of gamma-ray astronomy and represents the vast breadth and depth of the Galactic Science programme of H.E.S.S. over 15 years", says Werner Hofmann, long-term spokesperson of the H.E.S.S. experiment and spokesperson of the next-generation Cherenkov Telescope Array (CTA, www.cta-observatory.org). "We could only dream of detecting almost 80 VHE gamma-ray emitters in the Milky Way when we started the Galactic Plane Survey more than a decade ago", explains Mathieu de Naurois, current spokesperson of H.E.S.S. and research director at CNRS - Ecole Polytechnique, Palaiseau. The updated H.E.S.S. Galactic Plane Survey (HGPS) is not just a much deeper view of the inner part of our galaxy at extreme energies, it is a very thorough systematic study and the first time that major data products from this waveband are released to the entire astrophysics community (see www.mpi-hd.mpg.de/hfm/HESS/hgps/). "This will open the results to a much wider community of astronomers interested in cosmic particle accelerators. A public release allows the community to compare the H.E.S.S. data with other multi-wavelength datasets, and also breaks ground for the upcoming CTA observatory, which plans to release all data to the public." explains Christoph Deil of the Max-Planck Institute for Nuclear Physics in Heidelberg, who led the publication of the HGPS. The HGPS is also the basis for the characterisation of populations of gamma-ray emitters such as the abundant classes of pulsar wind nebulae and supernova remnants, three of which are newly identified here. In a second class of publications in this special issue, H.E.S.S. members perform precision measurements of individual particle accelerators such as RX J1713-3946, or entire regions such as the Galactic Centre. These studies reveal the detailed properties of the underlying particle accelerators and shed new light on how cosmic rays move through the interstellar medium and shape their environment. Finally, emission from hypothesised new object classes such as stellar-mass black holes orbiting massive stars or run-away stars has been searched for in the H.E.S.S. data. "The spectrum of topics covered in this special issue demonstrates that VHE gamma-ray astronomy has developed into a mature field. We are deepening our knowledge of high-energy astrophysics in our galaxy." explains David Berge, head of the gamma-ray group at DESY and coordinator of the H.E.S.S. special issue. The global community of gamma-ray astronomers is currently preparing the much more sensitive next-generation instrument, CTA, which is a global project built on two sites in the Northern and Southern hemisphere. Scheduled to move into regular operations in the 2020's, it will provide a more detailed and sensitive image of our Milky Way in gamma rays. Until then, the H.E.S.S. dataset published in this special issue will remain the state-of-the-art of this field. The collaboration: The High Energy Stereoscopic System (H.E.S.S.) team consists of scientists from Germany, France, the United Kingdom, Namibia, South Africa, Ireland, Armenia, Poland, Australia, Austria, the Netherlands, Sweden, and Japan, supported by their respective funding agencies and institutions. The instrument: The results were obtained using the High Energy Stereoscopic System (H.E.S.S.) telescopes in Namibia, in South-West Africa. This system of four 13 m diameter telescopes - recently complemented with the huge 28 m H.E.S.S. II telescope - is one of the most sensitive detectors of very high-energy gamma rays. These are absorbed in the atmosphere, where they create a short-lived shower of particles. The H.E.S.S. telescopes detect the faint, short flashes of bluish light which these particles emit (named Cherenkov light, lasting a few billionths of a second), collecting the light with big mirrors which reflect onto extremely sensitive cameras. Each image gives the position on the sky of a single gamma-ray photon, and the amount of light collected gives the energy of the initial gamma ray. Building up the images photon by photon allows H.E.S.S. to create maps of astronomical objects as they appear in gamma rays. The H.E.S.S. telescopes have been operating since late 2002; in September 2012 H.E.S.S. celebrated the first decade of operation, by which time the telescopes had recorded 9415 hours of observations, and detected 6361 million air shower events. H.E.S.S. has discovered the majority of the about 150 known cosmic objects emitting very high-energy gamma rays. In 2006, the H.E.S.S. team was awarded the Descartes Prize of the European Commission, in 2010 the Rossi Prize of the American Astronomical Society. A study performed in 2009 listed H.E.S.S. among the top 10 observatories worldwide.